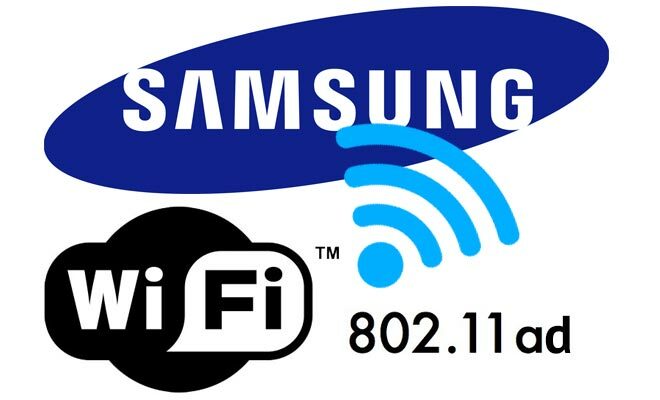 Wi-Fi 802.11ac is just starting to gain traction, but Samsung is already looking ahead. The company has announced that it has managed to complete the development of the Wi-Fi 802.11ad standard and is ready to commercialize it. The new standard operates at a 60GHz frequency and enables high transmission speeds of up to 4.6Gbps, which is 575MB/s. That’s an increase of five times compared to the 802.11ac standard, which is capable of 866Mbps, or 108MB/s. Samsung says that the 802.11ad standard maintains maximum speed by eliminating the co-channel interface and thus removing the gap between theoretical and actual speeds. The 60GHz frequency is more than 10 times faster than that of 2.4GHz and 5GHz Wi-Fi technologies. The company also went quite technical in explaining why commercializing the standard was a bit of an issue. Until now, there have been significant challenges in commercially adopting 60GHz Wi-Fi technology , as millimeter waves that travel by line-of-sight has weak penetration properties and is susceptible to path loss, resulting in poor signal and data performance. By leveraging millimeter-wave circuit design and high performance modem technologies and by developing wide-coverage beam-forming antenna, Samsung was able to successfully achieve the highest quality, commercially viable 60GHz Wi-Fi technology. But it’s not only the speed boost that the new standard offers. Just like its predecessor, the new standard enhances signal quality and distance by developing world’s first micro beam-forming control technology. Impressively, it optimizes the communications module in less than 1/3,000 seconds. So, when can we have this sweet Wi-Fi 802.11ad goodness? Samsung says that worldwide commercialization of the standard is expected as early as next year. Make sure that the company will bring the 802.11ad standard to its smartphones, tablets, Smart Home products as well as its medical devices.